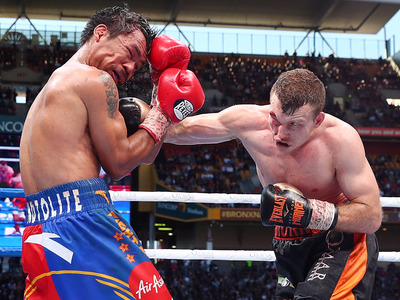 Manny Pacquiao lost a controversial decision against Jeff Horn after a brutal 12 rounds between the fighters in which the judges favoured the hometon Horn. Horn set the tone to start the fight, winning early rounds, rushing Pacquiao and throwing combinations while trapping him in corners. But as the fight went on, Pacquiao’s experience showed against his younger opponent, and Manny took a few rounds that many casual viewers would go on to score heavily in Pacquiao’s favour. As the final bell rang and the fight went to the judges, it appeared that Pacquiao had done enough take the contest, but the scorecards showed otherwise, awarding Horn a 117-111, 115-113, 115-113 unanimous decision. The magnitude of the upset now offers a ray of hope for another upcoming underdog, Conor McGregor. Horn was a heavy underdog against Pacquiao, with Vegas listing his odds around +450 or +500, meaning bettors who put $US100 on Horn, won $US450 or $US500, depending on when and where the bets were placed. Conversely, Pacquiao was the heavy favourite going into the bout, and even was talking of a potential rematch with Mayweather before the devastating loss. With odds listed between -550 and -600, he and judges surely sent some bettors home with empty wallets and angry with the result. These numbers are notable because they are strikingly similar to the current odds for the mega-fight scheduled for this August between Floyd Mayweather and McGregor. As of Friday, the Westgate Las Vegas Superbook listed Mayweather as a -650 favourite and McGregor as the +475 underdog. While the two fights are obviously different in a lot of ways, Horn overcoming the odds against Pacquiao may give hope to some McGregor supporters, and also may serve as a warning to any bettors looking to put too much money down on Mayweather thinking he’s a lock to win. The common thinking around the MayGregor bout is that Conor doesn’t stand a chance. He’s not a boxer by trade, and exploring the sport for the first time in his life against one of the best pound-for-pound fighters to ever step in the ring. But Horn was similarly dismissed going into his fight with Pacquiao. While undefeated in his professional fighting career, Horn had never faced competition the calibre of Manny Pacquiao, and was expected to be torn apart by the clinical application of professional skill the likes of which he had never seen before. Instead, the underdog came out swinging and held his own enough through the late rounds to keep his lead on the scorecards. It’s not impossible to imagine a similar scenario playing out if McGregor goes on to pull off an upset of his own. 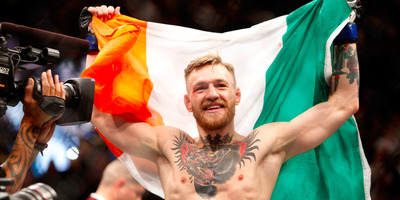 Despite their difference in speed, if McGregor can attack enough to show he is controlling the movement of the fight, and land enough punches on Mayweather to show he’s having an impact, there’s a chance he could steal a decision from the judges. Horn landed just 15% of his punches on Pacquiao and was able to win a decision. The Pacquiao-Horn bout also served a cruel result for those that bet that the fight would not go the distance. With the over/under on total rounds set at 9.5, under bettors looked set to cash in after Pacquiao had Horn on the ropes and running in the ninth round. Horn was able to survive the remaining rounds, and left the “Battle of Brisbane” with the biggest win of his young career. Conor McGregor will look to come through with a similar miracle win on August 26, when he faces off against Floyd Mayweather in Las Vegas.